Once a person has safely exited the premises and the fire is extinguished the real work of restoration begins. A team of fire damage restoration experts can often restore a property back to its pre-loss condition in less time that one would imagine. In many instances, fire causes major damage to only small portions of the property but the smoke and soot that the fire contains can spread to a much larger area. Simply cleaning a home damaged by fire is likely not going to be enough, as odors can linger in objects, carpet, walls, and any other porous surface if not properly treated. Apart from this, a fire can also weaken the structural integrity of the home which has to be checked by experts to prevent a ceiling or pillar collapse which can lead to even further problems. The top fire damage restoration companies offer emergency services in case of a residential or commercial fire. These companies have teams on standby that can immediately be dispatched in the event of a fire to provide immediate relief for your property. The job of extinguishing the fire is of course, the responsibility of emergency services and the fire department, but having a fire damage restoration team on site as well can further help curtail damages. The fire damage restoration team can begin working as soon as the fire is put out saving valuables that otherwise would be completely destroyed. The fire damage restoration team will then begin assessing the extent of damage to the property caused by the fire, smoke and soot. Items that are burnt or damaged beyond repair will have to be moved out immediately along with carpets, tapestry and fabrics as they are likely to have absorbed a substantial amount of smoke odor. This is an extremely important first step to having your home restored to its original state. The team of experts will offer advice as well as come up with a solution and a plan of action on where and how to begin restoring the damage. A thorough initial assessment allows for an accurate estimate to be made in terms of costs and time required for the complete restoration of the property. Watching your home and precious belongings consumed by fire can be one of the most severe and tragic losses that a homeowner can experience. 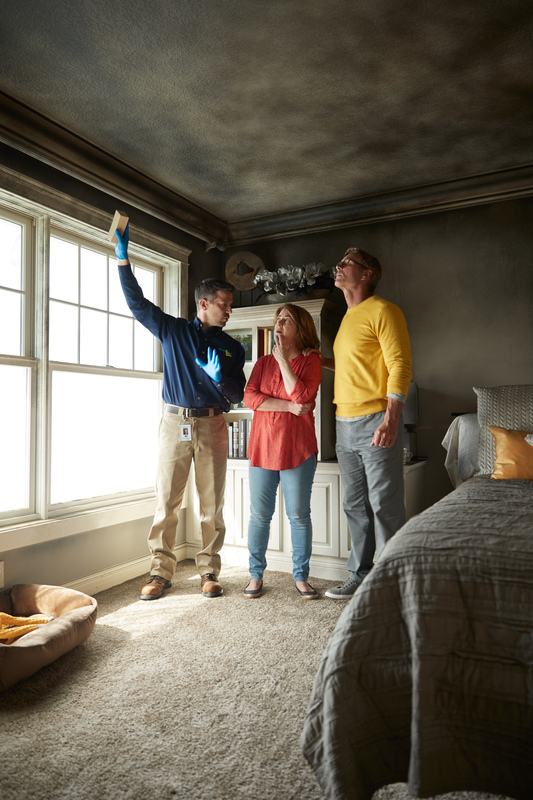 After such a devastating loss, reassurance comes from having clear guidance and support in salvaging as much as possible from fire and smoke damage. The main priority of any fire damage restoration team is to prevent damage from getting worse. In events of a fire, the intense heat can often cause a piper burst or ceiling collapse that can lead to further damages. A burst pipe can cause flooding that can lead to further contamination and destruction of property. A complete survey of the property is necessary to ensure that the fire has not caused unseen damages in different parts of the property that could lead to further problems in the future. Cleaning up after a fire is no easy task. Once the fire is out the affected area is dark, stained and charred with a strong stench of smoke and ash. The fire restoration teams first job is too clean off the charred areas of the property bringing it as close to its normal condition as possible. Items that are damaged beyond repair are removed and discarded immediately in order to curtail smoke odor and contamination. In the case of fire damage, it is important to address not only the directly affected areas but also in adjacent rooms and hallways. After cleaning up the affected areas the work of repair and restoration begins. This involves restoring furniture, walls, carpets, cabinets and appliances back to their pre-fire condition. In certain instances, the restoration process can often lead to renovation as professionals can give you great insight on how to redo a portion of your property in a much more practical and aesthetic manner than it was before. The main aim of any fire damage restoration team is to bring the property back to its normal condition before the fire but the very best restoration companies go one step beyond and actually improve the condition of your house making it look even more attractive than it was before the fire. The final stage of the fire damage restoration process is consultancy on safety measure and precautions that can be used to prevent a fire from happening again. Installing quality smoke detectors and fire extinguishers on the property can greatly lessen the threat of a fire breaking out. Consultation is often offered free of charge in order to educate customers on what to do and what not to do if a fire were to ever happen again. These fires start in the kitchen and are caused when food from the oven or stove are burned. The burnt food leaves a strong burnt odor and smoke residue on items and surfaces. In case of a kitchen fire, all appliances have to be cleaned out to ensure that no harmful chemicals have been left behind. They are many items in the household that contain multiple natural and synthetic materials that when burnt creates black smoke that is extremely toxic and dangerous if inhaled. This form of fire leaves behind copious amounts of black smoke residue along with synthetic smoke odors. In such cases, emergency corrosion mitigation is needed to protect at-risk surfaces. Natural fires often occur during heat waves when dried out shrubs, trees and bushes catch fire from the intense heat of the sun. These forest fires can cause devastating damage to urban and rural areas and can often spread hundreds of miles before being put out. It is necessary to take extra precautions during heat waves by keeping flammable items out of the sun and ideally in a dark and cool place like the basement. On certain occasions, a malfunction of heating appliances such as oil-fired furnaces can cause harmful and toxic smoke to spread throughout the property. Regardless of what type of fire it may be the best solution is to always get to safety and call the professionals to come put it out. It is also a good idea to never go inside the property and touch anything after a fire is put out as it may cause additional damage and even health problems if you do not know what you are doing. Only experts with the right training and tools should enter the property in order to determine the extent of damage and possible remedies. Certified fire damage repair technicians are able to restore even the most delicate belongings along with removing and cleaning up of smoke, soot and debris. Removing odor and smoke damage from fabrics and upholstery isn’t easy but they are certain things that one can do in order to reduce the impact of damage until the professionals arrive. Quick Action: Acting quickly is of key importance during or after a fire hazard as the longer smoke odor is left to linger on fabric or garments, the harder it is to completely remove. Odor Reduction: Before the cleaning process begins to identify items damaged by a fire that are beyond repair or not important so that they can be immediately removed from the premises. The fewer the items holding the smoke odor the faster the elimination process will be. Ventilate the Premises: Once the fire is put out open all the windows and air channels to try and circulate as much air as possible throughout the property. Fresh air will help to decrease the odor, while also dry out any moisture damage that occurred in the fire extinguishing process. Soot Removal: Soot and heavy black smoke have particles that contain chemicals and acids that cause further damage to objects and can be extremely injurious to health. Since soot holds odor, the smell removal process must be done by professionals using heavy duty or industrial vacuum to eliminate oily residue. Smoke Odor Counteractants: These counteractants are in the form of sprays that are used to eliminate harmful odors. Thermal Fogging: This deodorizing process uses pressurized force to disperse deodorant droplets in a similar manner to how smoke is spread. Airborne soot and smoke particles are hazardous to health. The acidic nature of soot makes it increasingly difficult to remove the longer it’s left alone. Since most of the material found in homes is synthetic it creates a variety of complex chemical reactions when burnt. The key to fire restoration is to act fast as items that could have been restored can easily become unsalvageable in a matter of days. No matter the situation never assume that you can prevent a fire from escalating. Always find safety first and leave the putting out the fire to the experts. Fire in itself is extremely dangerous but the smoke it emits is often even more dangerous than the fire itself. Never attempt to restore or clean up after a fire on your own as DIY solutions often lead to more complications than results. In case of a fire call in the experts and let them assess the situation and help with the process of insurance claims. Need a professional fire & smoke damage specialist to come to your home or business quickly? Contact ServiceMaster QRS, day or night, for speedy emergency service. We work with your insurance company. Call (773) 388-9200 today! Before calling for the fire restoration services, the best thing to do is to prepare the area as best as you can manage–and yes, this involves sorting through the items that had been recently torched and discarding the ones that can’t be used while setting aside the ones that are still salvageable. At the same time, opening all the windows to let fresh air in (and that sooty smell out) would help greatly since it would help to get rid of much of the sooty odor that comes with recently-put out fires. If I had the chance to call for a fire damage restoration service I would make sure that everything that’s salvageable is there for their services when they come around.